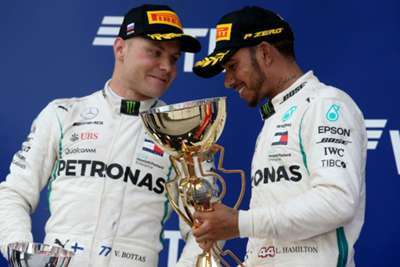 Lewis Hamilton says he does not need to gift Valtteri Bottas a win in Formula One this season as the Finn can earn one himself. In one of the flashpoints of the 2018 campaign, Mercedes ordered Bottas to let Hamilton through at the Russian Grand Prix as he sped towards the fifth drivers' championship he sealed last time out in Mexico. But even with the title race settled, Hamilton believes Bottas would not appreciate him returning the favour. "It's not something I've asked Valtteri if he wants, but I don't think he's going to want that. He's going to want to win it in his own way. I don't know if I'll be doing him any favours in the sense of giving him a win. "I don't think he needs that. I think he thinks he can do it himself. "All I can do is try to make sure I'm supportive throughout the process and the weekend. I'm always really open with my set-up, so I'll continue to do so. "It would be great for Valtteri to finish on a strong note, feel better in the car and finish off strong. Last year, he finished off strong and that really set him up for the beginning of this year. "He started off strong again and that is always, naturally, a good thing."